From dance anthems to love songs, the Justice Crew have been showing us their diversity of late, which is resulted in their long overdue album Live By The Words being released at the end of this month. We chat to Paulie about what to expect from the new album, their recent video, never losing their dance moves and sleeping in their undies. 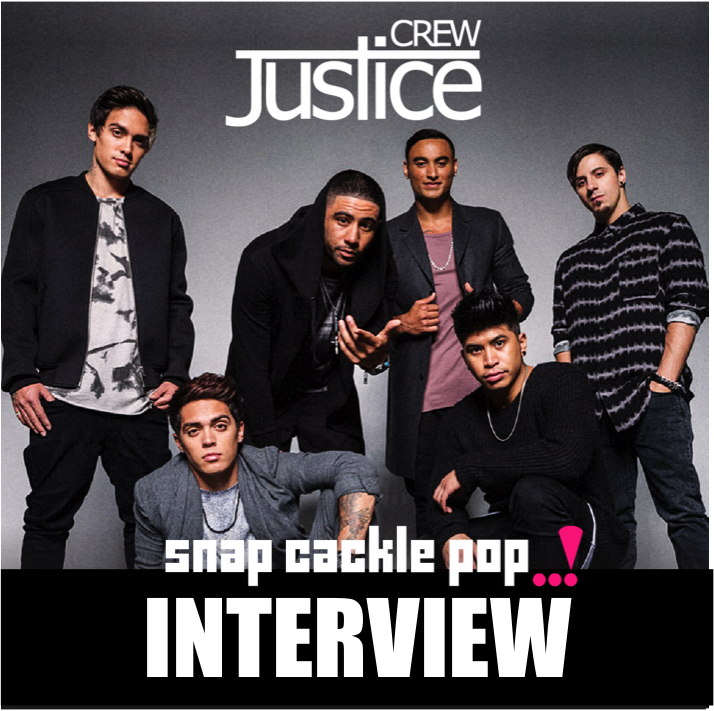 It's the SnapCacklePop Interview with Justice Crew..! Justice Crew in THE house! Welcome back to SCP. How you guys doing? So finally we get to talk to you about your debut album! Eeeek! It's been a long time coming hasn't it? Definitely, feels good to finally have a body of work! And want to explain to album title to your fans? The album is called Live by the words. Simply because we’ve used past memories and experiences, as well as present ones, to help us write, record and select the songs that are on the album. And the album artwork. All very serious, please explain. To be honest, it’s one of the only photos that has us all doing the same thing haha! Some photos that were taken couldn’t be used because some of the boys blinked, were smiling or laughing and it didn’t look appropriate in terms of the feel of the colours etc. The 5 other tracks in the album are all different, from a few party tracks, some are slower ones (not as slow as Rise and Fall). We all love them, and we hope you do too. Who have you worked with on the tracks/ album? Robopop, Zac Poor, Jack Miller, Jay Sean, Miracle, The Messagers, Mike Posner, Danny Mercer just to name a few. So let's talk recent video Rise & Fall. How much fun was it recording that on the beach and girls? Soooo much fun! It felt like we were just on holiday and they were filming us. Very lacking in the dance moves, how come? We felt like it wasn’t relevant to the song. Tis more of a love song so we wanted to connect with viewers on a more intimate and emotional level. We did put a new moves from when we were mucking around though haha. So your previous two videos have been "light on" with the dance moves. Have we lost the JC boys we first fell in love with? Definitely not! We’ll always have that element. As performers we want to expand, so lately we’ve been focused more on the music. Will there be more JC dancing to come with the new album? Should we be ready for a Justice Crew tour? And what does 2015 hold for you all? Hopefully a national tour, more music and international promos! Xmas is coming, what is on your Santa list? What do Justice Crew wear to bed? What's the best and weirdest fan stalker story you can share? At a meet and greet a girl asked me to sign her belly. Weeks later at another meet and greet she came back and showed me her new tattoo.. it was my signature on her belly! Finish the sentence...in 2015 Justice Crew will be...? in 2015 JC will be bigger than ever! Thank you Justice Crew. We love you, good luck with album and look forward to brining back the Dance moves. Thanks SnapCacklePop, you guys rock. Justice Crew's new album is available on iTunes pre-order now..!